Having a small bathroom does not mean you need to sacrifice style. Here are five tips to help create a serene sanctuary even in a small space. Corners can often be overlooked but they are the perfect area for major bathroom fixtures, such as sinks and bathtubs. More corner sinks can be found here. More corner tubs can be found here. Who said you can’t have a stylish tub and shower in a small space? If you prefer a modern shower, exposed shower fixtures are a great way to add a stylish accent. More exposed shower fixtures can be found here. Walls are a great area to create extra storage space and keep a spacious open floor layout. Wall mounted storage cabinets add more organizational space and come in many different styles. Wall mounted vanities are also a great option as they keep the floor space open and give the allusion of a larger bathroom. Console sinks create the same open space as wall mounted sinks with even more style variety. 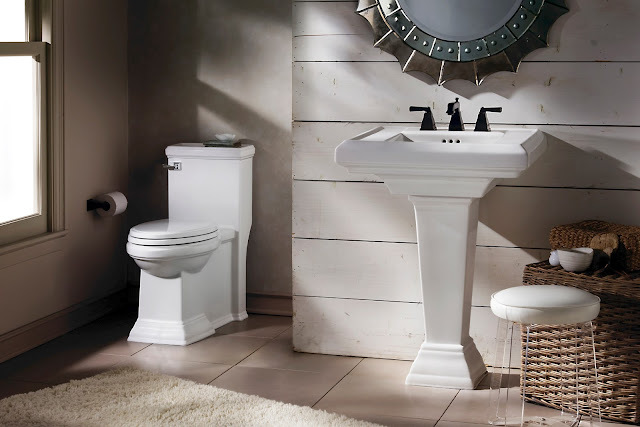 A vintage styled console sink is perfect for a small powder room while, for a more industrial or modern design, a console sink with metal legs can be used. The bars can also double as a hand towel rack. More console sinks found here. The ceiling is often overlooked. Adding overhead showers is a great way to utilize ceiling space and keep an open floor bathroom design. For more home design ideas, follow us on Instagram or share your designs with hashtag #vintagetubandbath.